Fire Poppy - Papaver californicum, is a native annual herb that grows only in California (endemic). Relatively uncommon and occasionally observed, this plant is found in the Santa Monica’s after chaparral is burned or brush along a trail is removed. The flowers of Fire Poppy can be Orange, Red or Brick Red or some variation between Orange and Red. 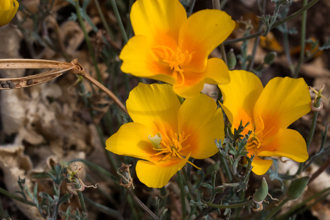 Fire Poppy grows below 2,500 feet in open, disturbed areas, in chaparral and woodland - primarily where it has recently burned. 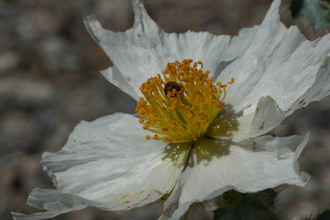 Fire Poppy can be abundant the first year after a fire - with the size of bloom diminishing in size until the next fire. Seeds produced from this bloom can be viable for many years, lying dormant until they receive their cue - the smoke from a fire causes the seed to begin the process of germination. The nodding buds appear to be top heavy on such spindly stems. Amazingly, when the flowers open, the stems straighten up and stand proud. I can attest to the fact that It is exciting to find Fire Poppies because we see them so rarely and their color is so vivid. The flowers are short-lived, -come back 24 hours later, and they may be gone! The leaves at the base and along the lower flower stalks are light green and often sparsely covered with soft, straight hairs. They are up to 3 1/2 inches long and deeply divided, then divided again into lobed segments. The stem can be hairy or hairless, and it may reach twenty-four inches in height. Fire Poppy is in flower in April and May, when long, slender stalks hold the flowers well above the leaves. 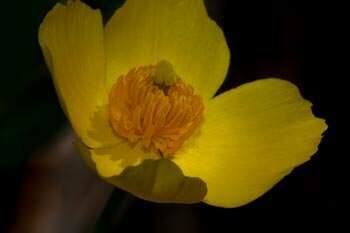 The flower typically has four petals and two sepals. 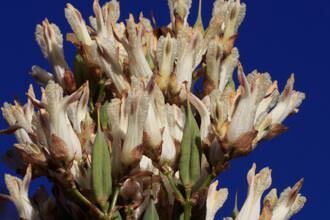 The flowers open and sepals get discarded. 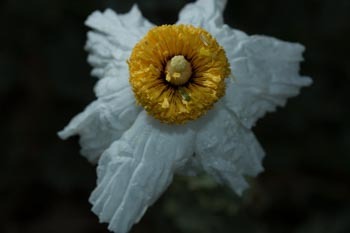 Each of the petals is about 3/4 inch long and has a pale green band at its base, which forms a light center, providing contrast for the many yellow stamens and the green pistil. 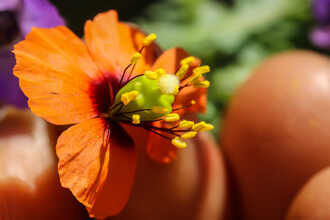 The pistil has up to 20 stigma lobes and will develop into a thick capsule with ridges. The apex of the pistil appears to be a doily. When it is time, pores open with many seeds dispersed. These seeds will bide their time in the soil until conditions trigger the process of creating the next generation of the species begins again. Papaver is the Latin name for poppy; californica means “of Californica”. Last modified: June 19 2017 11:07:43.